Each European Union member, including the Czech Republic and Latvia, must decide themselves when to implement the euro, Czech President Vaclav Klaus told members of the press today after a meeting with President Valdis Zatlers, and added that the Czech Republic is in no hurry to implement the euro. 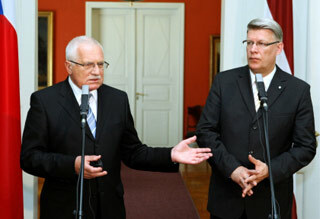 Vaclav Klaus and Valdis Zatlers. Riga, 20.05.2010. ''I do not wish to predict when Latvia and the Czech Republic will implement the euro. I only wish to say that we are in no rush,'' the Czech president said. Klaus explained that the costs to maintain the euro will be very high for the European Union, and that these costs will only increase in the future. At the same time, the Czech president emphasized that each country must decide itself when to join the euro-zone, as well as evaluate the pros and cons of implementing the currency in their respective countries, writes LETA. On the other hand, Zatlers, emphasized that the implementation of the euro would not only protect Latvia, but would help the country's growth and lead to a more controlled fiscal policy. As reported, Czech President Vaclav Klaus and his wife, Livia Klausova, began an official two-day visit to Latvia today.